You are here: HomenextPlacesnextStreetsnextGrand ParadenextWhere was this Hollingbury bus photographed? 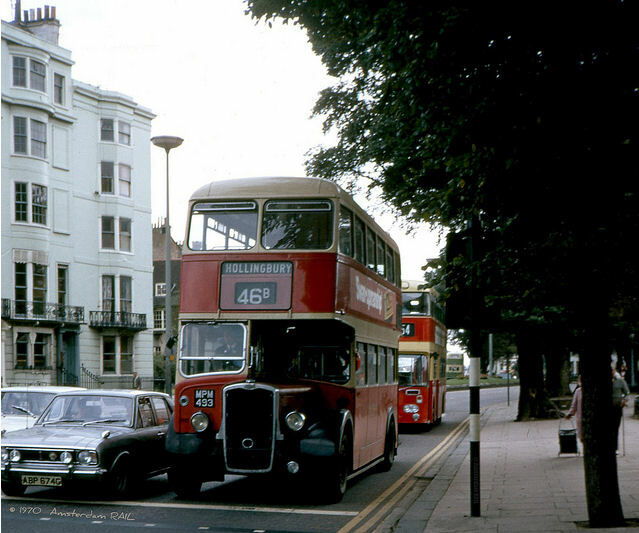 This photograph was taken sometime around 1968 – it is a digital copy of a colour slide of a Brighton & Hove Bristol K double-decker Hollingbury bus, taken in one of the streets in Brighton. Can you tell me where the photographer stood to take the shot? Lovley photo, I think the photographer stood in front of the Royal Pavilion, and the white building to the left is in Pavilion Parade, and it’s looking south towards the Palace (not Brighton) Pier. At the traffic lights at the junction with Edward Street, with the Royal Pavilion to your right as you look at the picture. The bus is travelling towards St Peter’s just going past the Royal Pavilion on the main road from the seafront. Looks like northbound opposite the Pavilion at the lights at the bottom of Edward Strteet, to me. It looks to me like The Old Steine is in the background and The War Memorial is on the right side of the photo? This seems to be at the north end of Grand Parade at the crossing near the bottom of Edward St.The building to the left is now a part of the University of Brighton and the home of QueenSpark Books. This seems to be at the north end of Grand Parade at the crossing near the bottom of Edward St. The building to the left is now a part of the University of Brighton and the home of QueenSpark Books. The bus is outside the Pavilion travelling north. This is the bottom of Edward Street, with the Royal Pavilion to the right of the picture. The photographer is standing at the T junction of Edward Street and Pavilion Parade; it does quote 1970 in the left hand corner. Well I think it’s just before the Old Steine, it was a long time ago. I have lived in Canada for 30 years so the memory is a bit faded. Coming from Old Steine with the Royal Pavilion on the right as you look at the photo. I’d say that the bus is waiting at the traffic lights at the bottom of Edward Street. The bus is facing north with the Pavilion to its left. I would put the date of the photo a little later than ’68 – I would have said early very 70s given the new bus behind which I remember coming into service, I think, the year I started at Varndean – 1970. The location is almost certainly near the Pavilion as that looks like the Old Steine in the background. Great! Another challenge for the greying cogs. This 46b is a route I will have taken many a time from town as once it reached the terminus in Hollingbury it then became the 26b. After a short break it would then journey on up the Carden Hill, (where I would get off), and down Ditchling Road back to the Open Market and finally the Old Steine from whence it started off. Our usual route would be the 26b but if there was a good enough reason to hop on board the 46b it was sometimes just as quick even though it included the wait at the terminus. I am curious to the small print in the bottom left corner of the picture; 1970 Amsterdam RAIL. I am also curious as to the position of the bus. That needs a bit more study and thought. Thank you for the photo. Charming to see again the driver in his private cabin and the fond memories jogged of the conductors calling, ‘Hold very tight please.’ And then the ‘ding ding’ of the bell informing the driver we are ready for off. Looking forward to other comments on the where-abouts. This was taken at the bottom of Edward Street. This could be the Level. It looks like the ‘Palace Pier’ entrance is across the road behind the buses. I would hazard a guess at it being the Old Steine looking back down towards the Pier ? This looks like the bottom of Edward Street, the Pavilion side looking towards the seafront. It looks like the St James’ Street side of Old Steine. The bus is stopped at the lights out side the Royal Pavilion at the bottom of Eastern Avenue just north of the Old Steine. This photo was taken by the traffic lights at the bottom of Edward Street, opposite the Royal Pavilion. The bus was traveling from Old Steine. To me it looks like it is passing the Royal Pavilion. It looks like it was taken opposite the bottom of Edward Street facing towards the seafront. The building on the left is now part of Brighton University. I was about 11 when this was taken and remember these buses very well, they were fabulous. The buildings on the left are in Pavilion Parade, which faces the Royal Pavilion (out of photo to the right). The bus has just left the Old Steine bus stop northbound, and is waiting at the traffic lights at the t-junction with Edward Street, where the photographer is standing. Its next stop will be in Marlborough Place, just north of Church Street and the Pavilion grounds. What a great picture. The bus is heading north with Old Steine in the background and the Pavilion to the right (just out of shot), and is waiting at the traffic lights at the junction with Edward Street. The Daimler behind on route 54 is one of a batch delivered between December 1969 and March 1970, and MPM 493 was sold in August 1971, so the shot was most likely taken in the summer months of 1970 or 1971, judging from the leaves on the trees. It looks like it could be in Pavilion Parade, facing north, at the junction with Edward Street, with the Old Steine in the background. Grand Parade, travelling north, opposite the Royal Pavilion. Great picture! Location has already been confirmed. Date is surely 1970 given the inscription (though why Amsterdam Rail? ), the following Daimler which was not in service when I conducted on BH&S in 1968 and the Hillman Hunter (I think) next to the bus which has a 1969 registration. Lots more transport pictures, please. The car beside the bus is a Mk. 2 Ford Cortina. It’s going along Grand Parade with Pavilion Parade on the left. I used to work in the blue building when it was Bosley & Co solicitors in 1969. 1970, as it says on the photo. How has no one noticed this? See earlier comments above, referring to the year shown on the photo. Do you remember this building?